Pitas, Wraps, Bagels, Soups, Bowls, Fingerfood (Jars)..Please send a request for our whole Menu. This room is part of a coworking-space on Torstrasse. It is perfect to have brainstorm sessions and workshops in an inspiring surrounding. The windows can be easily covered to make sure that confidential topics stay confidential. The WorkoshopRoom combines two conference rooms. Our rooms are equipped with TV Screens, whiteboards and flip charts. The strong Wifi signal ensures a smooth working process, even with bigger groups. The screens are equipped with AppleTV, Google Hangout and webcams. The total area of the space amounts to 60 m² and is suitable for a maximum of 30 people - extra tables and extra chairs are always available for free. With the help of an elevator, all areas of the coworking space are barrier-free accessible for all. 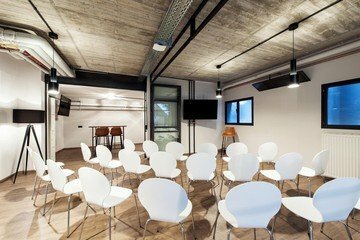 In addition, there is a very friendly service team in the coworking space, which will help you with all your concerns regarding the room details. The design of the Spaces has a strong appeal and almost reminds of the minimalism à la Bauhaus. The strong Wifi signal allows smooth high-speed work, even in larger groups. The rooms are equipped with writable walls, flip charts, and television screens, and they feature Apple TV, Google Hangout and webcams. You can simply book a video projector with a screen and a presentation case beforehand, if necessary - pens and paper are provided free of charge as well. You can also complete your booking with various catering options and thus have everything organized practically on site with just a few mouse clicks. 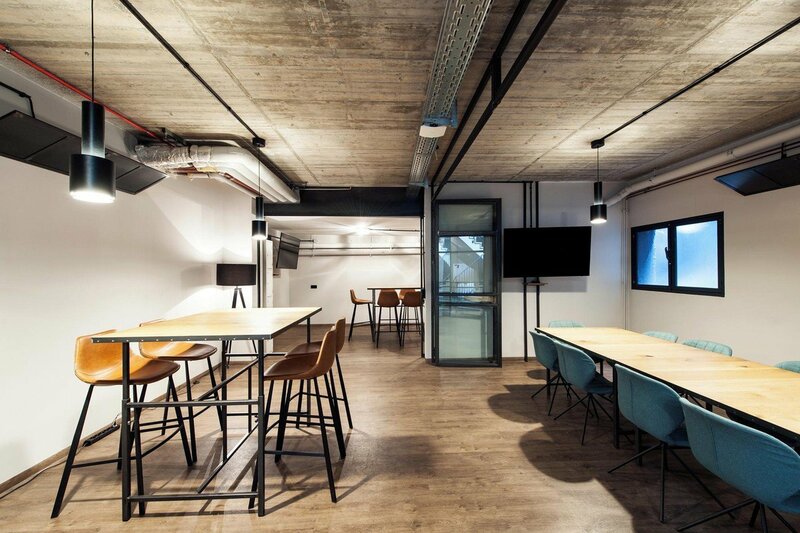 The location of the Coworking Spaces is located on the Torstraße and is best reached by public transport via the subway station Rosenthaler Platz - from here it is only a short 5 minutes walk. We booked this venue for two and a half days for a company offsite. The space was fantastic for us, a lot of room and great equipment. The food was fantastic and delivered straight to the room everyday, I can't think of any complaints and would really recommend this to a big group. The location is great too. Special mention and thanks to Igor who dealt with everything for us seamlessly! The description of the venue doesnt fit with the reality. The room is not bright, its located in the basement. There are also no "big windows". It was complicated to get in touch with the organizer. When we needed more drinks (we booked a flat) or any other kind of help nobody was around. We also booked lunch. Some of the meals were delivered wrong and some of them just never got delivered..